Reading and share top 12 famous quotes and sayings about Colossus by famous authors and people. 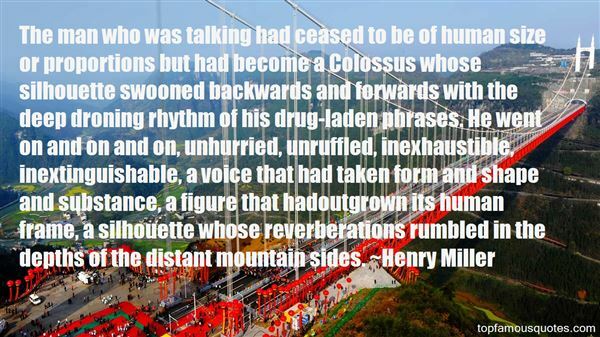 Browse top 12 famous quotes and sayings about Colossus by most favorite authors. 1. 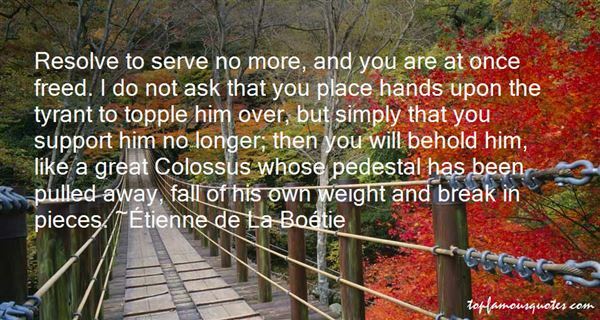 "Resolve to serve no more, and you are at once freed. I do not ask that you place hands upon the tyrant to topple him over, but simply that you support him no longer; then you will behold him, like a great Colossus whose pedestal has been pulled away, fall of his own weight and break in pieces." 2. "Here I had a strange idea not unworthy of de Selby. Why was Joe so disturbed at the suggestion that he had a body? What if he had a body? A body with another body inside it in turn, thousands of such bodies within each other like the skins of an onion, receding to some unimaginable ultimum? Was I in turn merely a link in a vast sequence of imponderable beings, the world I knew merely the interior of the being whose inner voice I myself was? Who or what was the core and what monster in what world was the final uncontained colossus? God? Nothing? Was I receiving these wild thoughts from Lower Down or were they brewing newly in me to be transmitted Higher Up?" 3. "Compare King William with the philosopher Haeckel. The king is one of the anointed by the most high, as they claim—one upon whose head has been poured the divine petroleum of authority. Compare this king with Haeckel, who towers an intellectual colossus above the crowned mediocrity. Compare George Eliot with Queen Victoria. The Queen is clothed in garments given her by blind fortune and unreasoning chance, while George Eliot wears robes of glory woven in the loom of her own genius.The world is beginning to pay homage to intellect, to genius, to heart.We have advanced. We have reaped the benefit of every sublime and heroic self-sacrifice, of every divine and brave act; and we should endeavor to hand the torch to the next generation, having added a little to the intensity and glory of the flame." 4. "The man who was talking had ceased to be of human size or proportions but had become a Colossus whose silhouette swooned backwards and forwards with the deep droning rhythm of his drug-laden phrases. He went on and on and on, unhurried, unruffled, inexhaustible, inextinguishable, a voice that had taken form and shape and substance, a figure that hadoutgrown its human frame, a silhouette whose reverberations rumbled in the depths of the distant mountain sides." 5. "In the serene weather of the tropics it is exceedingly pleasant—the mast-head; nay, to a dreamy meditative man it is delightful. There you stand, a hundred feet above the silent decks, striding along the deep, as if the masts were gigantic stilts, while beneath you and between your legs, as it were, swim the hugest monsters of the sea, even as ships once sailed between the boots of the famous Colossus at old Rhodes." 6. "Dexter the Magnificent, who doth bestride the world like a Colossus, many lovely corpses at his feet, brought to you in live color just in time for the evening news. Oh, Mama, who is that large and handsome man with the bloody saw? Why, that's Dexter Morgan, dear, the horrible man they arrested a little while ago. But Mama, why is he smiling? He likes his work, dear. Let that be a lesson to you--always find a worthy job that keeps you happy." 7. "Her mother leaned in. "She calls him ‘Colossus. 'Now what do you think that is for? ""I'm sure she's fine—""Not if she is with Colossus. She askedme last week if I could get her birth control. ""Okay, okay. What do you want me to do? ""I want you to find that campground andbring your sister home."...."Fine. ""You're going to go now? ""Do I have any choice? It's either that or let Lucy get impregnated by the Colossus, right?" 8. "I didn't believe for a minute that this liquid colossus, which had brought about the death of hundreds of humans within itself, with which my entire race had for decades been trying in vain to establish at least a thread of communication—that this ocean, lifting me up unwittingly like a speck of dust, could be moved by the tragedy of two human beings. But"
9. "Bigotry is the disease of ignorance, of morbid minds; enthusiasm of the free and buoyant. Education and free discussion are the antidotes of both. We are destined to be a barrier against the returns of ignorance and barbarism. Old Europe will have to lean on our shoulders, and to hobble along by our side, under the monkish trammels of priests and kings, as she can. What a Colossus shall we be when the Southern continent comes up to our mark! What a stand will it secure as a ralliance for the reason & freedom of the globe! I like the dreams of the future better than the history of the past. So good night. I will dream on, always fancying that Mrs Adams and yourself are by my side marking the progress and the obliquities of ages and countries." 10. 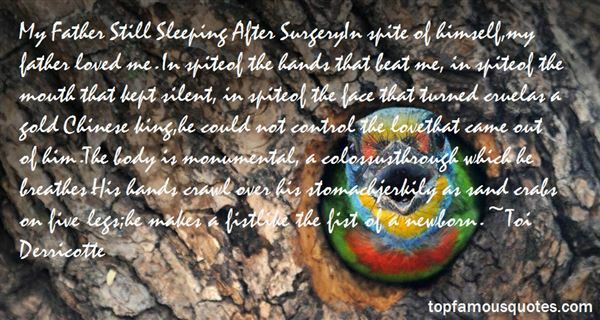 "My Father Still Sleeping After SurgeryIn spite of himself,my father loved me. In spiteof the hands that beat me, in spiteof the mouth that kept silent, in spiteof the face that turned cruelas a gold Chinese king,he could not control the lovethat came out of him.The body is monumental, a colossusthrough which he breathes.His hands crawl over his stomachjerkily as sand crabs on five legs;he makes a fistlike the fist of a newborn." 11. "Why man, he doth bestride the narrow world like a colossus; and we petty men walk under his huge legs, and peep about to find ourselves dishonorable graves." 12. "Bruckner's Eighth is a colossus." The role of a writer is not to say what we all can say, but what we are unable to say."